30-year Apple veteran Deirdre O’Brien will handle the company's retail push. Apple tapped Deirdre O’Brien to be its new retail boss today in light of the news that Angela Ahrendts plans to leave the company. While O’Brien may not be a household name to most Apple fans, she’s been with the company for more than three decades. From the days of Steve Jobs saving Apple from bankruptcy to watching Tim Cook leading the company to a first-ever $1 trillion valuation, O’Brien has seen huge changes during her tenure with the iPhone-maker. Now she’s set to be one of the most powerful people in Silicon Valley. Here are six things you didn’t know about the new Apple retail boss. O’Brien started her career at IBM, the same place Tim Cook started Apple, joining the company right after she left Michigan State University. “I was so happy to get the opportunity to work at Apple right out of college,” she said in an interview at Apple Park earlier this year. She joined Apple before Cook. “I was so blown away when I joined the company because you know when you first start working you have no idea of what corporations are like, and I loved that when I, a couple weeks into it I thought, ‘wow what I do makes a difference every day. Like I love this. This is fun.’ And I would say that has not changed. And I love that about Apple,” O’Brien told Cult of Mac founder Leander Kahney in an interview in 2018. Apple hired O’Brien back in 1988 – four years after the original Macintosh launched – to do production planning in the factory making the Macintosh SE in Fremont, California. The highly automated “factory of the future” closed after a few years because of chronically low Mac sales volume. When Cook joined Apple in 1998 as head of operations, O’Brien was one of the first members of his new team that overhauled Apple’s operations. She played a critical role in helping save the company from bankruptcy. O’Brien soon became part of Cook’s core team in operations, running demand forecasting. 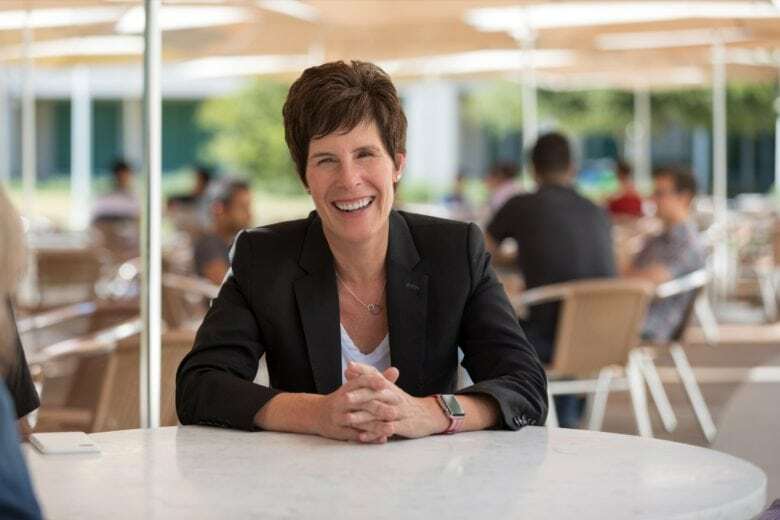 She was joined by several IBM alums, including Jeff Williams, who became Cook’s right-hand man and is now Apple’s COO; Bill Frederick, a logistics expert who headed up customer support; and Sabih Khan, who ran notebook operations. In 2007, Apple hired Rita Lane — who also formerly worked for Cook at Big Blue — to run desktop operations. Over her 30-year career, O’Brien rose through the ranks in operations working for Cook and then his successor as COO, Jeff Williams. In her time she worked under five different CEOs – John Sculley, Michael Schindler, Gil Amelio, Jobs and Cook. She is now Apple’s head of HR — the so-called “Veep of People,” a title she said was Cook’s idea. For the last few years, O’Brien has been heading up Cook’s initiatives to increase inclusion and diversity. The effort found its biggest success in Apple stores, which hire considerably more women and minorities than Silicon Valley rivals. These are relatively low-paying retail jobs, however, not cushy, high-paying positions at Apple HQ. Still, Cupertino has made some progress. NOTE: This post incorrectly stated that O’Brien worked at IBM. O’Brien started her career at Apple. We’ve corrected the mistake.